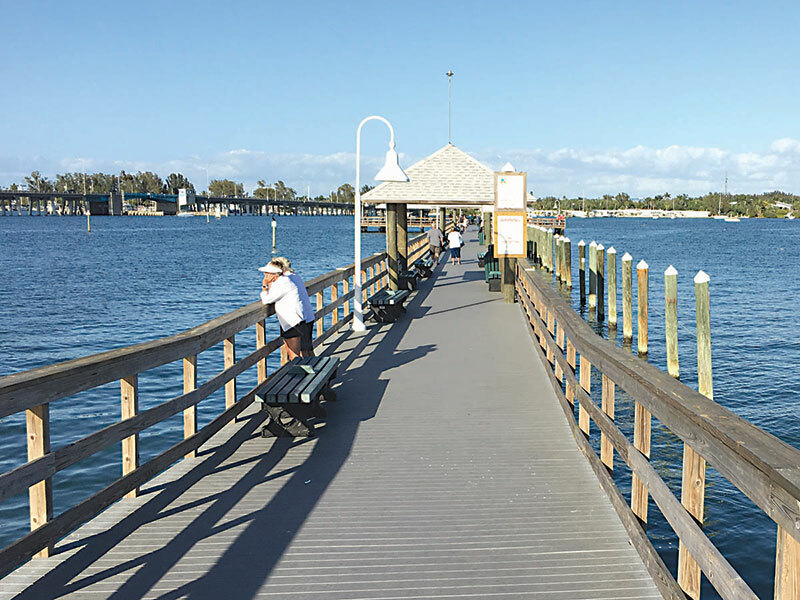 It’s been a long haul since the Bradenton Beach Community Redevelopment Agency first contracted with Technomarine Group in April 2017 to build and install a new floating dock for the Historic Bridge Street Pier. 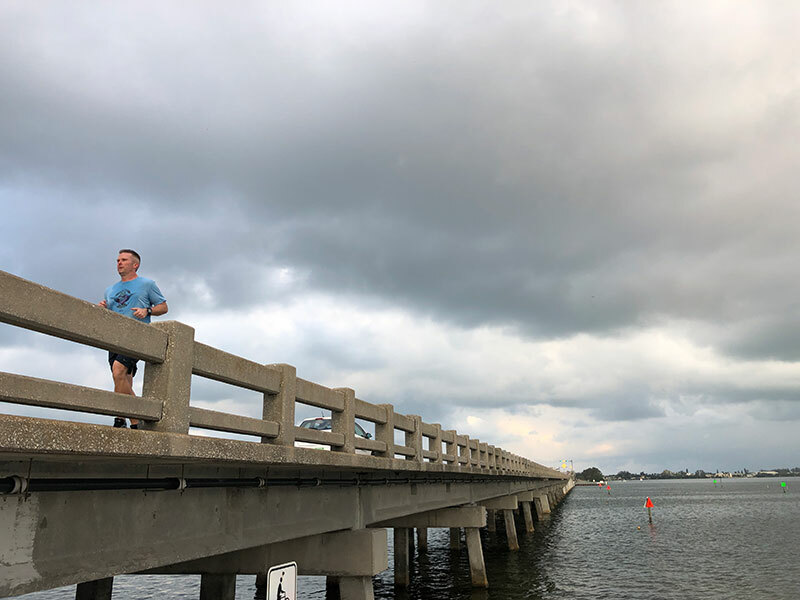 But parts for Bradenton Beach’s floating dock were being inventoried in Gibsonton March 26 as city staff worked on the next step — to bring all the dock components to the city — in preparation for installation. Before Hecker Construction can install the dock, the city must permit construction, including installation of pilings. 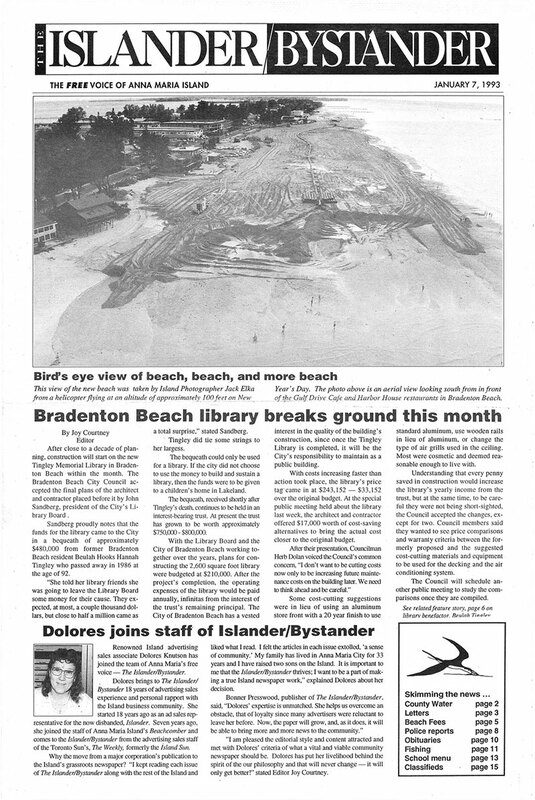 Bradenton Beach Police Chief Sam Speciale told The Islander March 26 that Eric Shaffer, a project manager for Hecker, informed him that day that an inventory of the dock parts would be completed and reported to the city within the week. Hecker — now working directly for the city — was initially contracted by Technomarine to supply and install the dock components that were shipped from Spain to Hecker’s yard. If Shaffer reports missing parts, Speciale said city attorney Ricinda Perry would contact Technomarine regarding what could be further failure to deliver the parts. 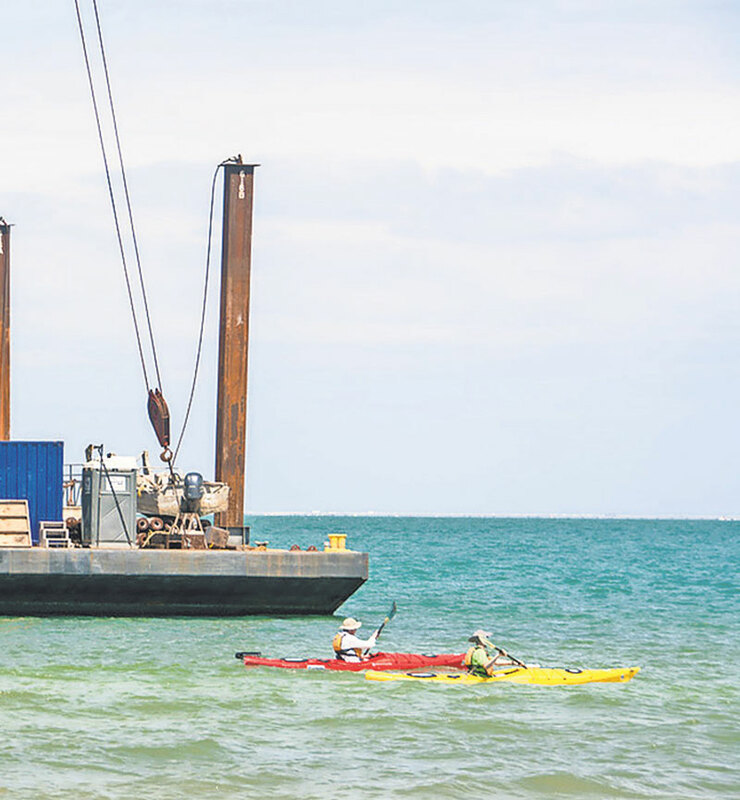 If every part is accounted for, Hecker will pair floats to the dock sections for assembly before delivery to Bradenton Beach via flatbed truck. Speciale said March 13 that Hecker had begun assembling the parts. He also previously said building official Steve Gilbert gave Hecker verbal approval to install the dock, pending specifications for the pilings. Technomarine originally planned to use concrete pilings, but, in early March, Hecker submitted engineering specifications for composite pilings. Speciale said Hecker opted for wood pilings with poly wrap, and would submit specifications to Gilbert for the pilings permit. Wood pilings are cheaper than concrete and composite piles, but more wood pilings would be required to support the dock. So new specifications are needed, according to Speciale. The chief said Shaffer also was preparing a proposal for construction costs to present to community redevelopment agency members at their next meeting at 9:30 a.m. Wednesday, April 3, at city hall, 107 Gulf Drive N. The CRA is funding the floating dock. Traffic — motorized and nonmotorized — travels early March 27 on the Anna Maria Island Bridge. A routine inspection, followed by routine maintenance, took place the week of March 25 but did not disrupt traffic. Eric Clark powered up the Harcon bucket boat early March 27 for a day of work under the Anna Maria Island Bridge. 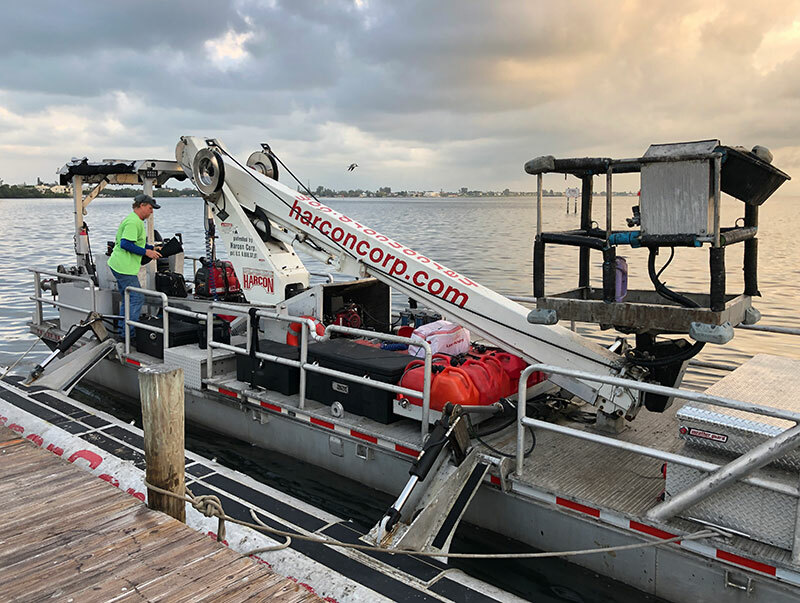 Clark works for Harcon Corp, a bridge access service subcontracted to assist on the Florida Department of Transportation’s spring inspection and maintenance of the Anna Maria Island Bridge the week of March 25. As Clark awaited the arrival of the work crew to the Kingfish Boat Ramp in Holmes Beach, captains departed from the ramp with fishing boats holding charter groups of four or five people. Near shore, a man sold bait by the bucket from a pontoon boat. On the horizon, the Sunshine Skyway Bridge was golden in the day’s first hour of sunshine. “It has its moments,” Clark said of his work — or his workplace. About 20 minutes later, storm clouds rolled in, rain blew sideways and a waterspout formed in the Gulf and moved east, toward the shore. Then, in the time it takes rain-soaked hair to dry, the skies cleared and work-worthy weather returned. March 27 and March 28 were maintenance days on the drawbridge connecting Anna Maria Island and Perico Island on Manatee Avenue/State Road 64. March 25 and March 26 had involved an inspection of the drawbridge’s underside, according to information from DOT spokesman Brian Rick. Similar work — intended to ensure the safety of the structures — was set to take place the week of April 1 on the Cortez Bridge. “The traveling public will not notice anything going on,” according to Rick. The custom lift on the Harcon boat allowed for close inspection without closing the bridge. The DOT eventually plans to replace both drawbridges with fixed high-span bridges, but construction funding has not been budgeted for either project. A third bridge to the island, the Longboat Pass Bridge between Bradenton Beach and Longboat Key, will undergo extensive repairs May-November. The DOT has said the repairs will occur overnight. Lynn Tran and Richard Hazen opened a new front for the treehouse in federal court. The Holmes Beach couple filed a six-count federal lawsuit, naming the city of Holmes Beach, mayors, commissioners, building and code enforcement officials and the Florida Department of Environmental Protection, as well as DEP officials. It is the second complaint filed in March by Tran and Hazen in the U.S. Middle District of Florida. A prior complaint was superseded by the new, amended complaint served at city hall March 27. DEP officials are in the process of being served, Tran said March 29. The six counts allege civil and constitutional violations under federal laws — Title 42, Section 1983, civil rights; Title 42, Sections 1985-1986, neglect and failure to prevent abuse; Fifth and 14th amendments, due process and equal protection; the First Amendment; the Supremacy Clause of the U.S. Constitution; International Covenant on Civil and Political Rights; and the Universal Declaration of Human Rights. In the suit, Tran and Hazen request a review by three federal district judges and an unspecified amount of money damages. An anonymous complaint brought the treehouse to the city’s attention in 2011. The DEP also was alerted to the treehouse, which apparently violated the state’s setback from the mean-high waterline. The new federal lawsuit is 96 pages. 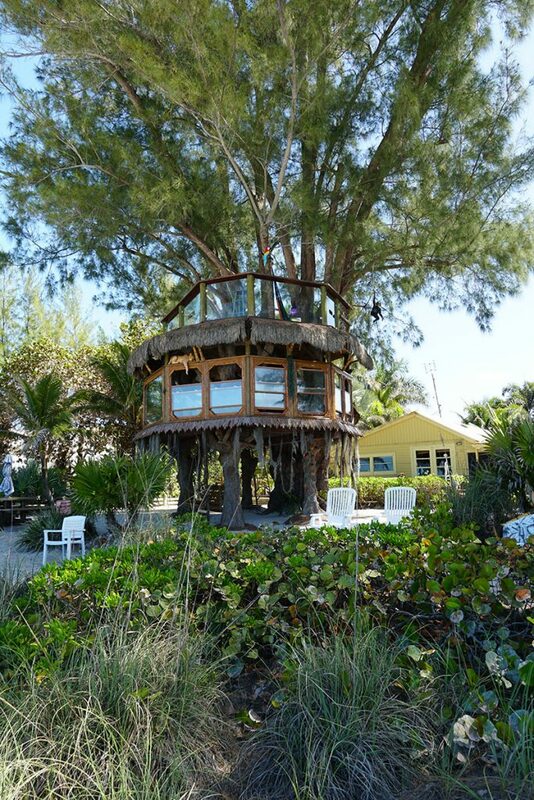 “With smiles, the city watched the plaintiffs build the look-alike Robinson Crusoe treehouse until one day, a caller complained” about the treehouse built without a permit. Asked about the allegations March 29, Tran said she had no further comment. Tran acknowledged filing an amended complaint March 25 with the same underlying facts as the prior suit but with different causes of action. The amended complaint came in response to a March 5 order from 12th Circuit Judge Charles Sniffen, which ruled the owners’ last petition for injunctive relief deficient in several respects, including a failure to allege a factual basis that imminent harm would befall the treehouse if he didn’t grant the owners’ petition. In amending the state complaint, Tran and Hazen refashioned their claim, calling it an action for negligence and petition for preliminary and permanent injunctive relief in addition to a violation-of-rights case. The next hearing in the Tran-Hazen constitutional case in state court is set for 9 a.m. April 29 in the Manatee County Judicial Center, 1051 Manatee Ave., W., Bradenton. Also, in a Manatee County courtroom, the city’s 2018 enforcement case is set for May 9 and June 3 hearings. The federal proceedings will be conducted in the Sam M. Gibbons U.S. Courthouse, 801 N. Florida Ave., Tampa. Through Feb. 28, the city paid $156,403.92 in treehouse legal costs, according to city treasurer Lori Hill. About the possibility of settling the cases, Dye said: “I like to say: Never say never,” but because the treehouse dispute is a regulatory issue — the fact the structure lies within a city setback — the attorney said he was doubtful a settlement could occur. Also, because the federal suit alleges damages, Dye expects the city’s Florida League of Cities’ insurance arm to assign attorneys to the case. He said his firm will continue to handle the state cases. Tran and Hazen have lost a string of cases since 2013 to keep the structure — built without state and city permits — after the city code enforcement boards, and, subsequently, a magistrate ordered the treehouse be removed and set daily fines. Currently, the city is seeking in state court to enforce the 2016 magistrate’s order requiring the treehouse removal and a $50 per day fine, which has accumulated to more than $67,000. After trying to negotiate an after-the-fact permit with the DEP and inquiries about applying for a permit with the city, the owners were turned away as the city stood firm against the setback issue for the treehouse. And the court cases began. In 2013, Tran and Hazen appealed the city code board’s decision to the 12th Circuit Court — saying they were lulled into not getting permits by building officials and commissioners, but the rules changed under newly hired city officials. Tran and Hazen were unable to satisfy the city’s request for a permit. Also in state court, the couple petitioned for a ballot question — to let the voters decide if the treehouse should be grandfathered, only to be told a state law precluded a development initiative by petition, despite the steps stated in the city charter. That case was brought for a review before the U.S. Supreme Court — but the review was denied. Three other cases — the city’s code enforcement claim, the couple’s pro se attempt to stop the code case and Tran and Hazen’s constitutional argument against the setback regulation — are still pending in state court. And her draw for Manatee County cost taxpayers a pretty penny. In January, a three-day visit by Jane Seymour to the Bradenton area included the unveiling of a 7-foot tall “Open Heart Icon” by Seymour at the Bradenton Riverwalk, an invitation-only reception at the Studio at Gulf and Pine in Anna Maria and a lecture at the Manatee Performing Arts Center in Bradenton. But will the cost of at least $193,981.50 bring a return for the Manatee County Tourist Development Council? Guests at the Studio art reception clamored for photos with the star. There was a lot of browsing of the dozens of the prints, oils and statues offered for sale — priced $2,000-$30,000 — at the Studio. However, not one item sold, according to Tina Chiles, who manages the art gallery. Chiles’ husband, Ed, is a member of the TDC board. He owns the Studio at Gulf and Pine, the Sandbar and Beach House restaurants on Anna Maria Island, and Mar Vista Dockside Restaurant and Pub on Longboat Key. Earlier that day, Seymour attended an unveiling of the 7-foot-tall icon of her “Open Hearts” jewelry design purchased by the TDC for the Realize Bradenton Art Walk Project. She also spoke Jan. 19 at a ticketed event at the MPAC. 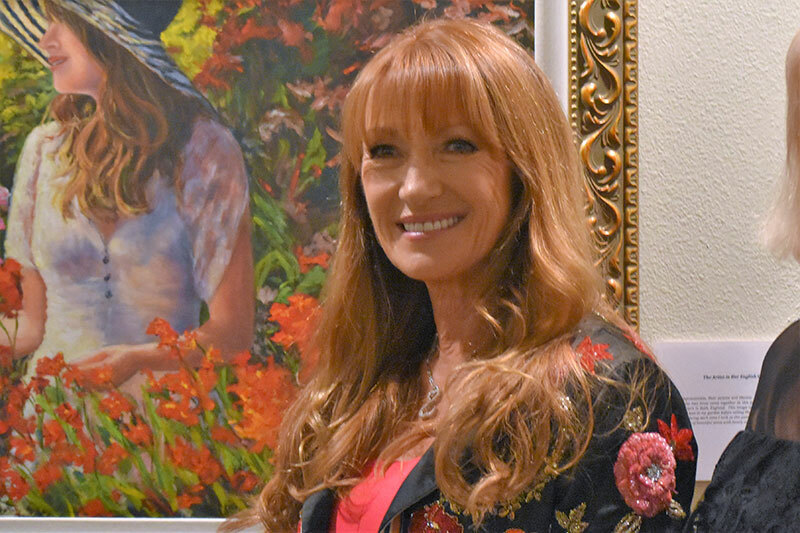 In the talk, “Jane Seymour Art — Up Close and Personal,” she shared her philosophy and her life challenges with the audience. One of her sons, a musician, opened the two-hour show. The event did not sell out, and the Bradenton Area Convention and Visitors Bureau offered some tickets to locals at no cost to fill the seats, according to an Islander source. 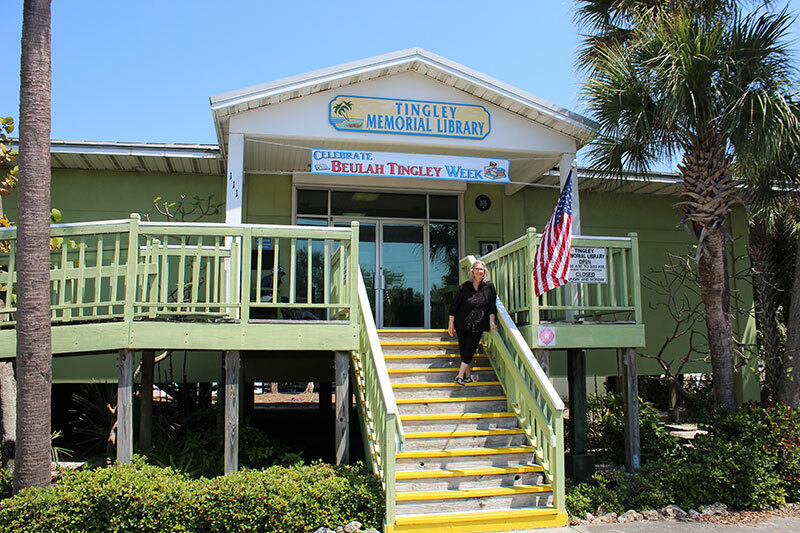 Seymour’s appearance and a series of music concerts held at nonprofit venues were promoted by the BACVB to help businesses and workers overcome the impacts of red tide in 2018. Much earlier, however, before the outbreak of red tide in Manatee County, on June 18, 2018, Elliott Falcione, executive director of the Bradenton Area Convention and Visitors Bureau, asked the Manatee County Tourist Development Council to amend an agreement with Realize Bradenton to increase funding for art in the urban core $150,000, as a one-time expenditure. Realize Bradenton is a nonprofit that promotes redevelopment and economic growth in downtown Bradenton. Riverwalk is a 1.5-mile downtown city park overlooking the Manatee River. It includes a splash pad, skate park, open lawns and numerous public art exhibits. The TDC makes recommendations to the Manatee County Board of Commissioners on how to spend tourism development tax collections. A 5 percent resort or “tourist tax” is paid on rentals of six months or less in the county, and use of that money is restricted to develop and promote tourism in Manatee County. The meeting minutes show that Falcione said the success of the Realize Bradenton Art Walk was resonating well in the marketplace and the BACVB wanted to continue its partnership by allowing Realize Bradenton to add more artwork at Riverwalk. The motion to approve the expense carried unanimously. 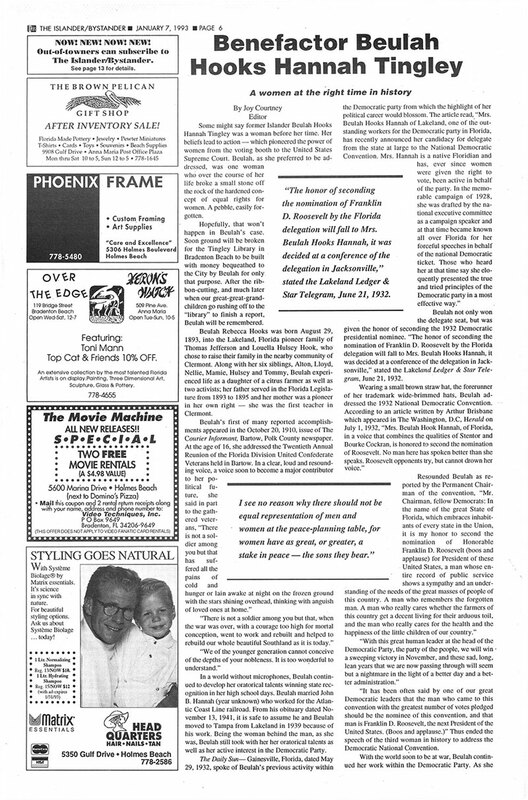 The minutes include “Exhibit A,” a description of the project, which states the county would reimburse Realize Bradenton in an amount of $182,065, including $150,000 for a permanent mounted sculpture with a first payment of $67,500 after Realize Bradenton executed an agreement with Coral Canyon Publishing and Gallery for a “one-of-a-kind art sculpture” for the park. Coral Canyon and its director, Susan Nagy-Luks of California, represent Seymour, among others. Records provided to The Islander by Manatee County show a $602.39 reimbursement to Nagy-Luks for airfare and parking for a May 15-18, 2018, visit to Bradenton — a month before Falcione recommended the Realize art purchase to the TDC. A summary of the “Open Hearts Sculpture Event with Jayne (sic) Seymour” furnished to The Islander by Manatee County Commissioner Carol Whitmore, shows $193,98150 was spent for the creation and installation of the sculpture at Riverwalk and for bringing Seymour to the area for three days. Also listed: $8,118.35 in airfare, parking, entertainment and lodging expenses for Nagy-Luks for advance preparation and expenses during the January event. Other costs were $1,047.50 for tent rental for the Jan. 18 unveiling at Riverwalk, $2,500 for shipping the icon to Riverwalk and $198.81 in costs for invitations, email marketing and a Facebook promotion. The numbers furnished to The Islander do not include costs incurred by the Studio at Gulf and Pine, shipping charges for the displays or catering for the Jan. 18 private reception. Chiles’ studio paid shipping to and from Anna Maria for nearly 50 items. An agreed upon commission split, which the Studio declined to discuss, became a moot point, since none of Seymour’s art sold. The one-page summary does not include costs incurred by the Manatee Performing Arts Center, and how much or who else was paid or revenue earned in conjunction with Seymour’s lecture. 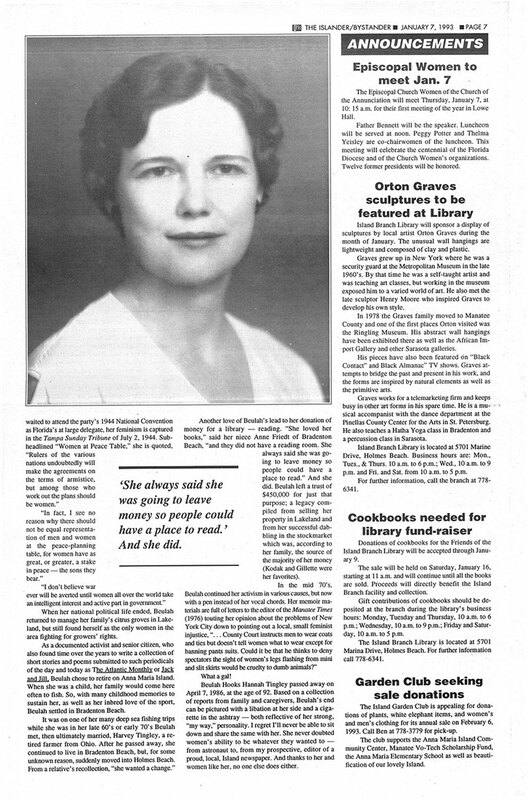 According to a U.S. News & World Report article Jan. 21 on the Open Hearts Icon unveiling in Bradenton, Falcione first met Seymour at an art show while on a business trip some 10 months before her appearances in Manatee County. He failed to say April 1 where and when they met in an email exchange. It also was reported in the same article that the statue was a gift to the city of Bradenton from the BACVB, the TDC, the Manatee county commission, Fawley Bryant Architecture, Kimley Horn and NDC Construction. Whitmore advised The Islander by email March 29 she was working to fulfill the public information request initially made to Falcione March 15, regarding expenditures related to Seymour’s visit and the related music concerts. The BACVB and Whitmore also were asked to furnish contracts for the promoter and entertainers and the expenses related to the music concerts sponsored by the BACVB with funding from the TDC — events that were held at the MPAC and the Center of Anna Maria Island. Florida’s open records laws provide the opportunity for anyone to request records from public agencies, government entities, and those accepting and spending public funds. Falcione told The Islander the concert accounting would be made public by Janene Amick of the MPAC, the ticket agent for the concerts, at the Monday, April 15, TDC meeting to be held at the Center of Anna Maria Island in Anna Maria. Chris Culhane, executive director of the center ,said last week he had only gross sales information for the concerts at the center. Amick was out of town and could not be reached for comment and an email to Coral Canyon Publishing remained unanswered as of press time. 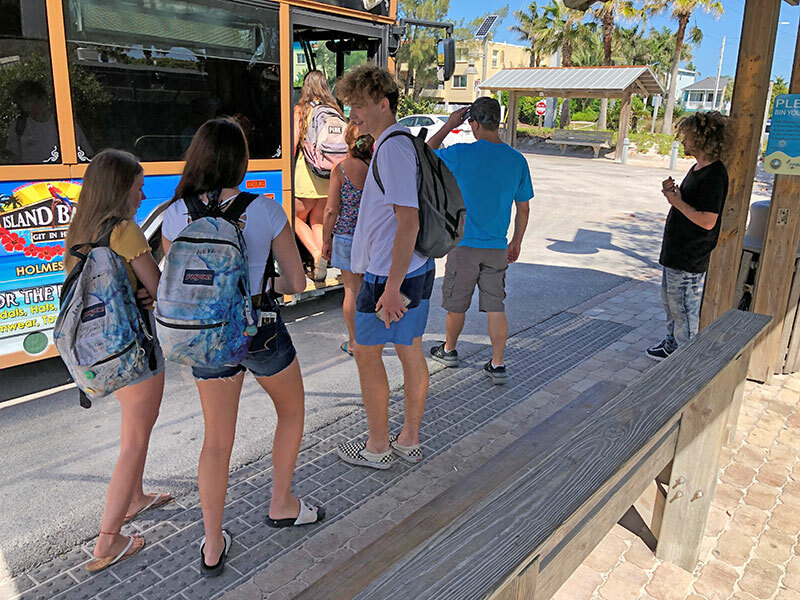 Ubering between an airport and Anna Maria Island may be this season’s popular arrival method, but what about arrivals in March 2045? The staff, board and committee members of the Sarasota/Manatee Metropolitan Planning Organization will seek to answer to such questions in their next long-range transportation plan, which will contain short-term and long-term transportation strategies through 2045. The MPO is the regional transportation planning entity for Sarasota and Manatee counties and its long-range plan must be updated every five years. Adoption of the document is set for next October or November, Leigh Holt, strategic planning manager with the MPO, told the MPO board during their meeting March 25 in Sarasota. In developing the document, planners must look at the road network, pedestrian paths, bike trails, transit systems, parking access, railroads and airports. They also must use estimates and assumptions for population, land use, travel, employment, congestion and economic activity, according to Holt, who shared a data report March 25. Two of the regions “top 20 high priority crash locations” are on Anna Maria Island, but probably not where motorists would expect. One priority location is Anna Maria’s North Bay Boulevard between Pine Avenue and Poinsettia Road. The other is at Gulf Drive between 58th Street and Holmes Boulevard. Annual population growth of 0.93 percent is estimated for Sarasota County and 1.5 percent for Manatee County. Environmental restrictions on development will influence population distribution — 12 percent of Manatee County and 30 percent of Sarasota County is preservation or conservation land. Growth on Anna Maria Island and in other coastal communities may be constrained by the ability to obtain or afford flood insurance. About 26 percent of single-family homes in the two-county region are at risk of flooding. The Sarasota/Manatee area generally has an aging population, but the working-age population also is expected to climb. Automated, connected, electric and shared-use vehicle technologies, as well as e-commerce growth, likely will disrupt traditional transportation modes. The length and frequency of red tides and other harmful algal blooms will impact tourism and possibly development. The average commute time is 25.4 minutes in Manatee County and 23.6 minutes in Sarasota County. About 79.7 percent of Manatee County residents drive alone on their commute, 8.7 percent carpool, 1.4 percent walk, 0.8 percent take public transportation and 0.5 percent ride bicycles. Holt encouraged attendance at the next MPO meeting, which will feature presentations from a representative of each jurisdiction in the Manatee-Sarasota region. “It will be a longer meeting, and it will be in a workshop format,” she said, noting that city and county officials will be invited to present their long-range priorities. Additionally, experts will address smart growth and development. “We will begin to build a vision from those presentations,” said Holt. The next meeting of the MPO will be at 8 a.m. Monday, April 22, at University of South Florida-Sarasota-Manatee’s Selby Auditorium, 8350 N. Tamiami Trail, Sarasota. The Sarasota/Manatee Metropolitan Planning Organization is the regional transportation planning entity for Sarasota and Manatee counties. MPOs are established by state and federal laws and through interlocal agreements to provide a process for local governments to coordinate with the Florida Department of Transportation, the Federal Highway Administration and the Federal Transit Administration. Anna Maria Island has one voting seat on the MPO. The island mayors meet as the Island Transportation Planning Organization and rotate serving on the MPO board. When there isn’t much to change, there isn’t much to discuss. 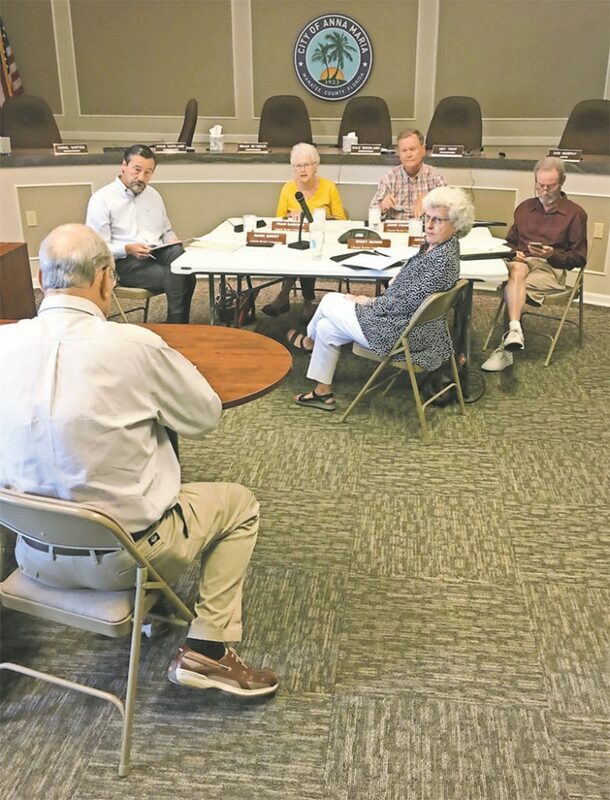 The Anna Maria Charter Review Commission met March 27 for a final review of its recommended changes to the city charter. CRC members voted 5-0 for a final, revised version of the charter containing proposed changes for presentation to city commissioners at a joint meeting 6 p.m. Thursday, April 25, at city hall, 10005 Gulf Drive. Throughout their review, CRC members discussed hiring a city manager, term lengths for elected officials and redefining “residency,” but then agreed not to recommend any changes related to those issues. Instead, CRC members recommended smaller changes to the charter, including several typographical and grammatical changes. One proposed change would require city commissioners approve a mayoral appointment to the treasurer position. The treasurer is the only chartered position in which a mayoral appointment does not require commission approval. Another recommended change would insert language calling for a city commissioner or mayor to forfeit his or her position for violating the state’s code of ethics for public officials and employees. The state allows for a governor to step in and remove an elected official for unethical conduct or criminal acts, but the charter has no provision regarding the removal of elected officials for violations of the state code. Commissioners will vote on the charter group’s recommendations. Any proposed amendments will be included on the next ballot before the electorate in November. The charter review commission, consisting of unpaid members, will dissolve after their meeting with city commissioners. A potential issue may have been identified in the plans for the new Anna Maria City Pier. Robert Pelc, president of Advantage Trim & Lumber, commented on The Islander’s website that, “There could be a major design flaw with this project!” He claimed the planned ipe planks for the walkway and T-end decking would “cup and twist” due to limited airspace between the wood and the supporting material. Pelc wrote that Advantage Trim & Lumber is the largest manufacturer of ipe decking in Sarasota, and the problem he identified would be exacerbated if the city neglected to oil the ipe wood, which would seal the wood from the elements. The city plans to use 3/4-inch by 5 1/2-inch planks, which Pelc wrote would be too long and thin, and to seal the material when installed. Pelc was out of the country and unavailable for an interview before The Islander’s press deadline. Mayor Dan Murphy told The Islander March 28 he hadn’t received any messages from Pelc, and questioned the validity of Pelc’s claims. He said it sounded like Pelc was critical because the city did not purchase materials from Advantage Trim & Lumber. Murphy said he would share Pelc’s claims with engineers on the pier project and look into any similar concerns if they are presented to him in-person at city hall. As of March 28, i+iconSOUTHEAST had driven 135 of 201 total pilings for the pier. Murphy said he expected Icon to finish driving and leveling piles by the end of the month. He said the city hired divers for a March 30 underwater inspection of the pilings to identify any issues. Two pilings, both included in the T-end footprint, failed during the driving process, according to Murphy. One was hit and broken by Icon’s work barge and another broke for an undetermined reason. Murphy said Icon experts were investigating why the second pile broke, but figured it was due either to pile-driving issues or a faulty pile. Following completion of the walkway pile-driving, Icon will place a concrete deck on the T-end and begin installing wood bents to support decking on the walkway. Murphy said materials would be brought by barge to the site. The contract requires Icon to complete the walkway and T-end by Aug. 27 or pay a $975 penalty for every workday after the deadline. Murphy scheduled a meeting with pier tenant Mario Schoenfelder for April 10 to update him on the progress of the project. The city has not prepared a request for proposals to construct the designed restaurant and bait shop at the T-end.